We looked at the top 1 Hand Blenders and dug through the reviews from 8 of the most popular review sites including BestReviews, New York Times Wirecutter, Consumer Reports, All Kitchen, Recipes For Anything, Blend With Us, The Top Pro, The Best Blenders and more. Through this analysis, we've determined the best Hand Blender you should buy. Its extremely low price point makes the Cuisinart Smart Stick CSB-75BC Hand Blender popular with consumers. You'll get 200 watts of power with the motor to help you mix a wide range of ingredients. It only comes with one mixer attachment, but it resists spatter and blends easily. In our analysis of 70 expert reviews, the Cuisinart Cuisinart Smart Stick CSB-75BC Hand Blender placed 6th when we looked at the top 10 products in the category. For the full ranking, see below. Checkout The Best Hand Blender for a detailed review of all the top hand blenders. Aside from the convenience, the Cuisinart Smart Stick 2-Speed hand blender also has a one-touch on and off button, comfortable handle, and ergonomically designed grip for better control and grip when in use. Because of its convenient size, hand blenders can be used to blend inside jars, bowls and stock pots. The CSB-75BC Smart Stick gives you a ton of versatility in the kitchen in an easy to use package. It uses a powerful 200-watt motor to handle many tasks, and the stick is designed to reach into all sorts of the deep container. This hand blender is very easy to use. You can use it to mix in almost any container and it fits comfortably in the palm of your hand. Not recommended for crushing ice. Produced a slightly chunkier puree. There’s one issue: the plastic gear. You will find blending easier than ever with this Cuisinart Smart Stick hand blender. Pick it up to blend cold drinks, hot soups, and crêpe batter – right in the pitcher, pot or bowl. It’s comfortable to hold, easy to use, and the blending shaft and beaker are dishwasher-safe. Enjoy! This Cuisinart Smart Stick Hand Blender is designed to handle a variety of basic tasks. Elegant brushed chrome or a variety of bold colors houses a powerful motor, and the handy “stick” design lets you blend in a pot, bowl, or pitcher. With two speeds, you can handle all your food prep tasks on high or low. Operation is easy and cleanup is quick. What could be better? As smoothies and juicing have become more popular, consumers are increasingly looking for an easy way to blend items. Pulling out a big blender every day can become so much work, you may even give up on your plan to juice. Cleanup makes it even more of a chore since many blenders have to be disassembled each time you use them, with some parts requiring handwashing. A hand blender can be a great way to blend items quickly that also allows for simpler cleanup than a traditional blender. With a hand mixer, you can quickly blend, puree and froth everything from pancake batter to milkshakes. Depending on the version you choose, you can either mix your items in your own bowl or cup or blend using a special cup provided as an accessory. One of the best things about this type of blender is that it’s easy to store when not in use. Unlike a full blender, you won’t have to set aside a large amount of space for storage. However, some blenders come with accessories, which means you’ll need to be able to keep everything in one place so it will be together when you need it all. Spattering is an ongoing issue with mixers of all types. Some hand mixers are built to contain ingredients to the mixing bowl or cup where they’re being blended. Look for one with blades specially designed to keep spatter to a minimum. You probably also want to mix a variety of ingredients using the mixer you choose. Although many mixers come with a standard spatter-resistant blade, others require additional attachments that either come in the packaging or must be purchased separately. Add-ons, like whisks and potato mashers, can extend the use of your mixer, making it even more valuable. Some mixers also include a container that you can use for mixing instead of a bowl or cup from your own stash for mixing items. Handheld mixers have a history that isn’t too different from the countertop mixers that have been around since the 1800s. A Maryland tinsmith patented the mixer with rotating parts in 1856, but the invention of the whisk and egg beater immediately followed. 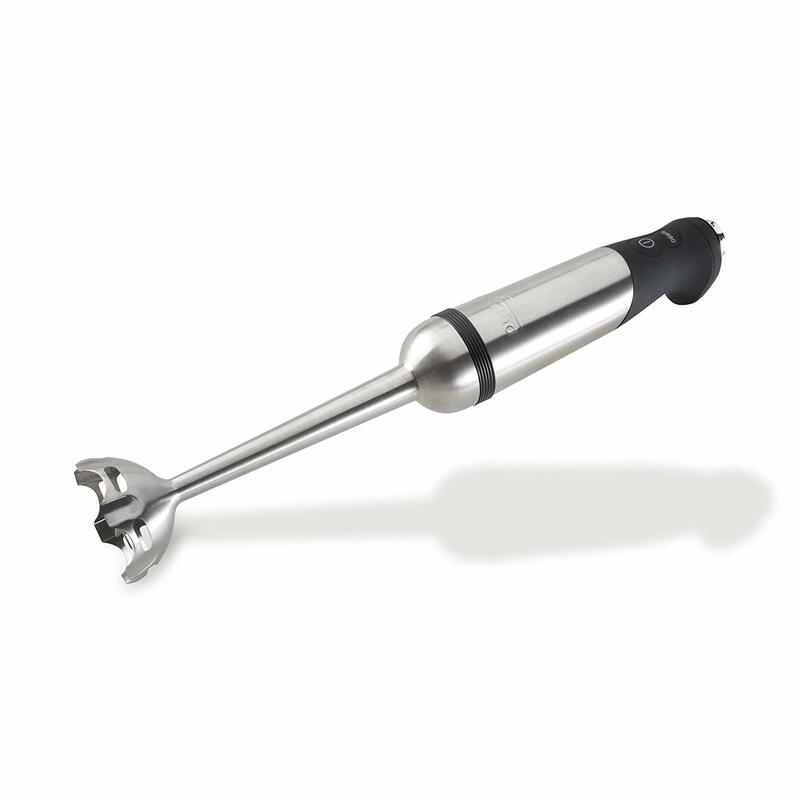 The demand for a handheld version of the mixer increased as Dover eggbeaters became popular throughout the U.S. The first handheld mixer came along in the 1920s when KitchenAid brought one to market. The Sunbeam Company later began selling one that was lighter and less expensive. Competition soon heated up, giving consumers a variety of options for mixing ingredients without breaking a sweat. The more you can change up the speed you’re using, the more control you’ll have over the finished product. The Breville Control Grip Immersion Blender builds in 15 variable settings. 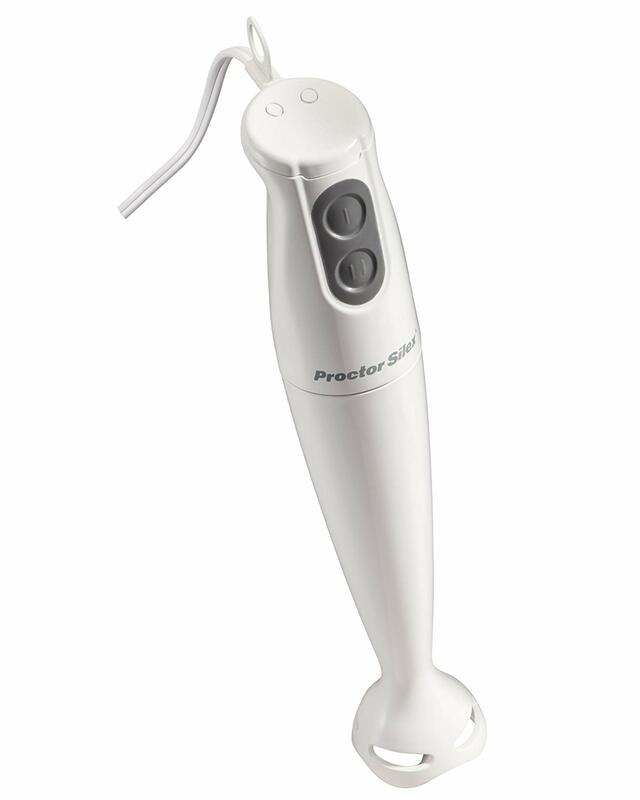 The Philips ProMix Hand Blender builds speed control into its power bar, which can be accessed with one hand. You can even squeeze it as far as it goes to get a quick boost of power. Once your blending is done, cleanup time begins. 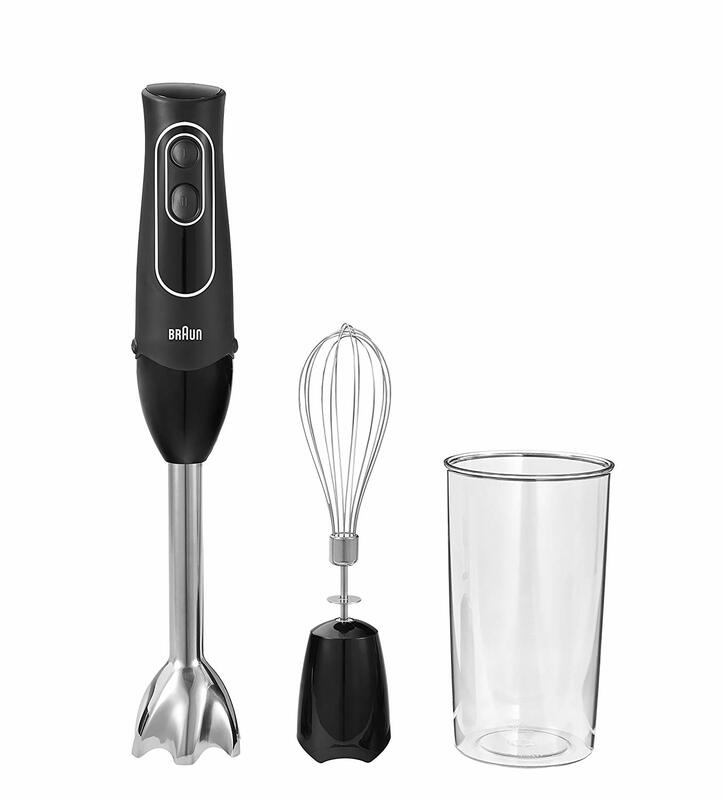 The Breville Control Grip Immersion Blender and Philips ProMix Hand Blender are both dishwasher safe, and the Philips ProMix Hand Blender’s retractable shaft makes it easy to dislodge any food residue. The handle is your main point of contact when you’re using a hand mixer, so comfort is important. The Breville Control Grip Immersion Blender has a rubberized handle to make it easy, but those with smaller hands may find the handle too big. The BraunMultiquick Hand Blender has an ergonomically-designed handle to keep things as comfortable as possible. With that mixer, though, you may find the buttons take extreme pressure, which can quickly become uncomfortable. The power buttons also seem to be placed pretty high, so you may find you can’t reach them as comfortably as with other mixers. One issue with any mixer is spattering. The last thing you want is cake batter all over your kitchen, so it’s important to find a blender that will keep things contained. The Breville Control Grip Immersion Blender and BraunMultiquick Hand Blender both resist spattering to keep cleanup to a minimum. When you’re finished mixing, you’ll want to be able to easily detach the arm for cleaning. The Breville Control Grip Immersion Blender snaps off without much resistance. The motor itself is important, making a difference in the time it will take you to get results. 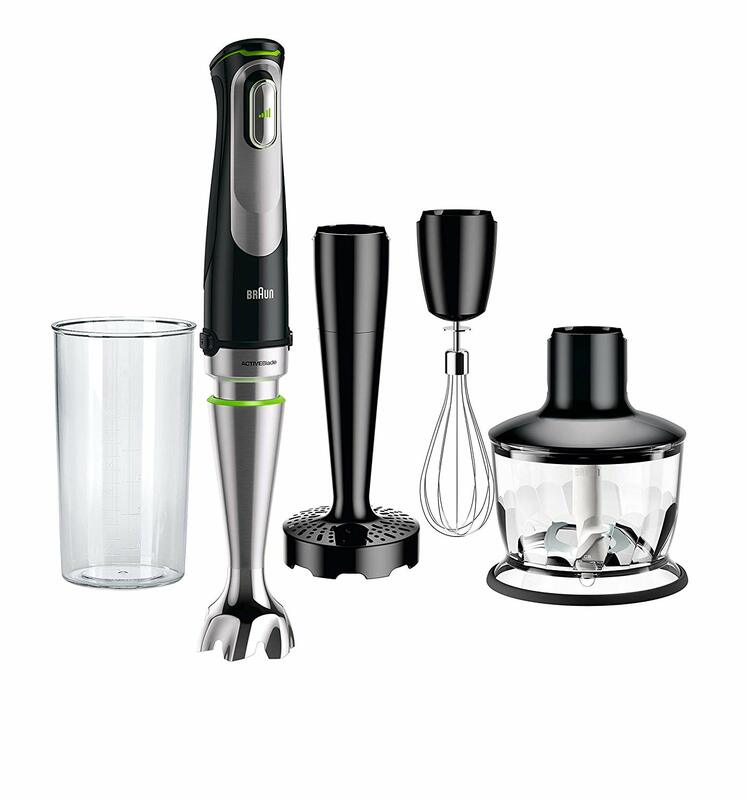 The Philips ProMix Hand Blender has a 300-watt motor, while the Breville Control Grip Immersion Blender packs in 280 watts and the Cuisinart Smart Stick CSB-75BC Hand Blender is 200 watts. The design of your blender can make a big difference in its versatility. The Breville Control Grip Immersion Blender is light enough that it can take on your favorite mixed beverage, but it also has the weight necessary to tackle thicker items like milkshakes and soups. Stainless steel blades ensure not only great blending power but durability as well. 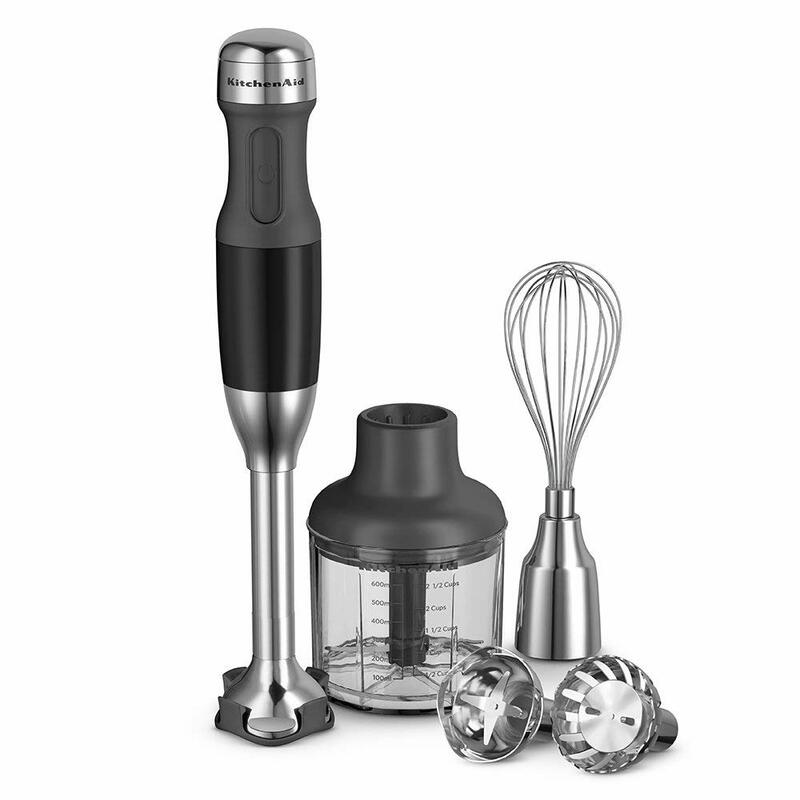 The Breville Control Grip Immersion Blender, BraunMultiquick Hand Blender and Philips ProMix Hand Blender feature stainless steel blades. With the Philips ProMix Hand Blender, the blades are also coated in titanium for extra strength. Attachments can be a differentiator too. The Philips ProMix Hand Blender lets you choose your attachments, so you can buy a chopper, mixer, whisk and potato masher attachment and switch out as needed. However, each of these costs extra. For the purchase price, you only get the blender and a standard mixing blade. Some mixers come with a mixing cup, which can come in handy. The Breville Control Grip Immersion Blender has a 42-ounce jug and a three-cup chopping bowl for mincing herbs, nuts and cheeses. 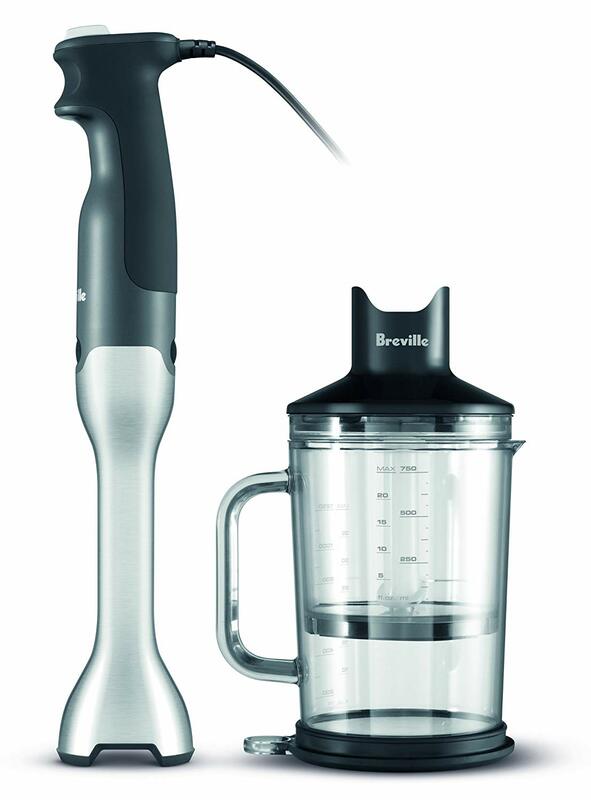 The BraunMultiquick Hand Blender’s mixing cup is not even half the capacity of the Breville mixer’s cup. You’ll get both a whisk and a mixing blade with the Braun blender. Price is also a consideration when choosing a hand mixer. The Cuisinart Smart Stick CSB-75BC Hand Blender is a simple mixer, but it’s also highly affordable, retailing below $50. The BraunMultiquick Hand Blender is also fairly affordable, retailing for more than $50, but you’ll get a whisk and a mixing cup for that. You’ll have to pay more for each attachment with the Philips ProMix Hand Blender, which is still affordable at less than $100.